Drink and Drug News has published an article this week that challenges the drugs field to be less economical with the truth about the war on drugs and alternatives. The reason I felt moved to write this piece is that relative silence on the issue from those that governments perceive as 'experts', maintains the fiction that prohibition was, is and shall be the foundation upon which drug policy should be built. My contention is that when prohibition is challenged by those fields (including harm reduction and drug treatment agencies, criminal justice NGOs, international development NGOs, criminologists, sociologists, health agencies, police, judiciary, prison governors etc.) who are identified by governments as knowing the score, that it will make the regime significantly more vulnerable. The time willcome for a full-frontal attack on prohibition,i am sure of that. At the moment it's stonewall is being weakened and made porose,and then,in the near future,it will hopefully be all guns blazing! I'm glad you want to see a Blueprint for regulation, because that is destined to be our next major publication. My colleague Steve Rolles is writing it as we speak. It will provide precisely the detail you are asking for - what a post prohibition system of regulation would look like, not just in the UK, but globally. 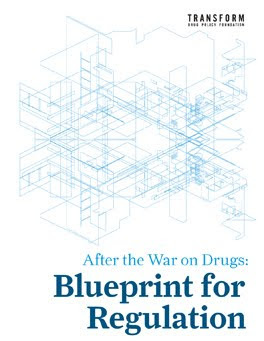 Provisionally titled 'After the war on drugs - Blueprint for a regulated market', it is due out in spring of next year. 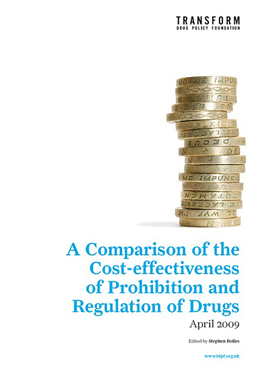 The regulation of supply is an area with which many drug producers and users will not agree. Particularly given that now, many users of cannabis grow their own. After all, who would want the " white-coated men from the ministry" trampling through every greenhouse and shed in the UK. Will there be "permits to produce"? How much will they cost, to whom will they be allocated? Will supplies from Africa and Asia be regulated? One aspect of prohibition hitherto undiscussed is the growing of coca bushes and opium poppies in developed countries. One looks forward to reading the "Blueprint". Seems allowing the "white coated men from the ministry" into my medicine cabinet means I don't have to worry about "tactical armoured storm troopers" letting themselves in at all hours of the night. Personally I prefer my natural medicine in an unadulterated form. I don't want medicine adulterated by an illegal supply chain, or adulterated by a legal pharmaceutical company supplying it's corrupted synthetic substitutes. I want my medicine Natural, and legal, is it too much to ask? You are correct in that producers and users will disagree about regulation. Organised Criminals will not want legal regulation and control as it will strip them of high profit margins, remove them from the equation no? Users of course don't want to be criminalised, don't want to mix with organised criminals for supply, don't want adulterated medicine, or pay the high prices maintained by prohibition. The "Blueprint" is another reason to look forward to spring, besides the daffodils. We would seem to be in accord with most aspects of legalisation, however, I`ll still "root" for outright freedom to grow and use, without parameters. The production costs (cannabis) per kilo are almost pennies, in fact, in some places it grows wild, and the only cost is a walk to the hills..
Regulation of a common weed? What next, annual inspections of our lawns and lofts, quality controls for Blackberry bushes? Whether storm troopers or white-coats, both are instruments of the state, neither should be permitted entry to our homes. Beer: ten free pints. Cannabis: death penalty.